Planted in 2000, Fish Creek Mount of Olives is a 100% Australian owned company, with a total of 2000 Frantoio and Corregiola olive trees. 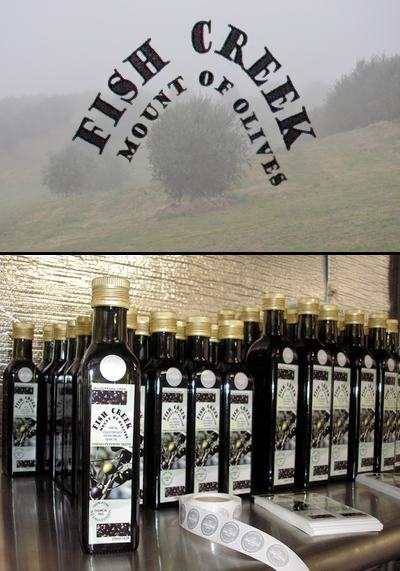 Fish Creek Mount of Olives is a family owned business located 2 hours from Melbourne in South Gippsland. The 40 acre grove produces Extra Virgin Olive Oil of the highest quality, produced unfiltered, cold pressed and chemical free. Winning the Silver Award in 2008 and the Bronze Medal in 2010 at The Royal Melbourne Show for Cold Pressed Extra Virgin Olive Oil, we are sure that you will enjoy its fresh peppery taste. At Fish Creek Mount of Olives we process olives for other growers, following strict standards to ensure an Extra Virgin Olive Oil of the highest quality for our clients using their produce. We use an Olio Mio 250kg three-phase processor, capable of processing up to 250kg per hour. As a result of having this fantastic piece of machinery we have the capability to process up to 2 tonne in one day.